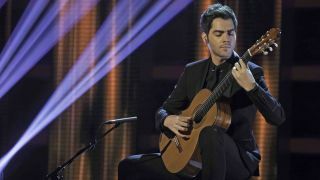 Miloš Karadaglic is an award-winning classical guitarist, but his latest album, Blackbird, is a step away from his core repertoire in that he's chosen to release a collection of Beatles songs. The album has received some very favourable reviews and made a considerable dent in the classical charts, too. Born in Montenegro, Miloš's attention was drawn to the guitar at a very early age. "I started to play when I was eight years old. Earlier in my life, the big influence on me musically was my grandmother, because she had a very beautiful voice and she always used to like to sing very nice, traditional Montenegrin songs." The young Miloš took up the classical guitar at school and began working his way through the student repertoire. At first, he showed a little unrest, having discovered that learning the guitar was not at all what he imagined. But finding a record by the legendary classical player Andrés Segovia among his father's record collection changed his life completely. "I heard an instrument that I thought was incredible. I couldn't believe that everything that I heard was coming from just one guitar and one player." Tasteful touch, combined with tremendous technique. Anyone covering Beatles material is generally acknowledged as being on hallowed ground and many have fallen by the wayside in the attempt. But Miloš has brought something very special to the mix, in that he has chosen to perform some stunning arrangements by masters of the craft such as Sérgio Assad and Toru Takemitsu. "It all started by selecting the right songs," he explains. "Which, to me, was such an important thing, because I needed to find the songs that are absolutely going to be able to translate into the texture and the colour of the classical guitar." Even if classical guitar is not necessarily your thing, you will admire the lengths that Miloš has gone to in order to produce Blackbird. For the recording, he chose to book into Abbey Road Studio Two in order to soak up some of the residual ambience from The Beatles' own sessions all those years ago. He even used some of the original microphones to ensure the mojo was just right. "It was one of those things: I said, 'I want to do it the right way,' so it made no sense to do it anywhere else." Naturally, spending most of his professional life playing the classical repertoire, the gear side of the Miloš Karadaglic story is pretty straightforward. No mighty rigs or humongous stacks around these parts; just premium-grade nylon-string guitars made by the world's master builders. He began with a Ramirez Student model, working up to an instrument by the Spanish builder Bernabé. These days, he plays a guitar by Australian luthier Greg Smallman, whose customers include the maestro John Williams. "I think the reason why I like Smallman so much is because John Williams was such a huge inspiration for me in my early days and his records were on a loop day in and day out." You might choose to catch Miloš in his home environment, the classical context, by checking out his previous albums, which include Aranjuez, featuring what is arguably the most famous guitar concerto out there, Rodrigo's Concierto de Aranjuez. Then there are his concert tours, which vary from him playing with a complete orchestra to more intimate, solo performances. But if you want to hear some sensitive, beautiful arrangements of familiar Beatles tunes on nylon-string guitar, look no further than Blackbird. "The most important thing always is to preserve integrity as an artist and to do something that absolutely feels right. For me to record The Beatles, at this stage in my life and career, felt an absolute right decision and the right thing to do." Miloš Karadaglic's new album, Blackbird, is out now on the Decca Classics label.